The Chester Fritz Auditorium, a magnificent center for the performing arts, is considered the finest facility of its kind from Minneapolis to the West Coast. Since its opening, the Chester Fritz Auditorium has brought numerous nationally acclaimed performers to Grand Forks and to UND. Programming has varies from country-western, opera, ballet and symphonies, to Broadway Theatre shows. 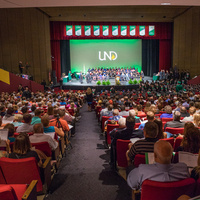 The Auditorium is also used for many University of North Dakota events. It was slightly blurry but it really was great overall. What a great concert and an enjoyable afternoon! The performers were great! Thank you! Perfect venue for live sound and here we had one of the greatest rock bands in history performing their classic hits. The orchestra was effective, the lighting was great, and the performances were stellar. Maybe the best concert experience I've ever had. This was an awesome concert. We had a great time singing along with the crowd. They were amazing and the orchestra was off the charts!!! It was super fun because they got the whole audience involved. It was an amazing time. Lots of energy from the contestants. The emcees were really fantastic engaging everyone. Would do it again.